What comes to mind when we write “freeway underpass?” It’s likely that whatever you pictured didn’t involve thoughtfully composed landscaping, actively used pathways or cool art installations. This article by Alissa Walker explores how cities across the country are reinventing the underpass, perhaps one of the most neglected of city spaces. Reinventing public space into something that’s actually usable for the public is near to our hearts. Examples we’ve written about before are projects like PROXY in San Francisco and the High Line in New York City, two urban areas that were reinvented from parking lots and derelict elevated railway lines, respectively, as spaces for people to hang-out, play and enjoy. Inspired by Alissa’s article, we set out to find a few more examples of reclaimed underpass space in cities near PUBLIC Stores. If you’ve been to an underpass park or live near one, drop us a line with a photo and we’ll add your city to this list! Once a renegade spot for illegal skateboarding, Burnside Skatepark was getting so much use it eventually won favor from the community and became city approved. Cool story. The I-5 Colonnade Mountain Bike Park in Seattle was built by a team of volunteers and includes over 2 acres of bike track and walking paths. It’s part of a larger 7.5 acre park. 3. SoMa West Skate and Dog Park in San Francisco, California. The SoMa West Skate and Dog Park in San Francisco includes a sanctioned space for skaters to shred and a little artificial turn for letting city dogs run around. 4. Proposed Wildlife Overpass in Los Angeles, California. Ok, so not an underpass, but worth mentioning. This proposed 165-foot-wide, 200-foot-long overpass would allow large carnivores like wildcats and bobcats a means of getting from one set of mountains to the other without ending up as roadkill. Art display under Highway 87 in San Jose, Photo by San Jose Office of Cultural Affairs. We love the bike for the simple pleasure it brings to us –– the smile it puts on our faces and the way it helps us connect with our local communities. When reflecting on the true nature of the holidays and the crazy, often violent world we live in, two Italian radio hosts are encouraging us to reflect on the bike’s role in history and its humanitarian benefits. While the Nobel Peace Prize is generally given to individuals or organizations, think about the bike as a messenger of peace the next time you take a spin. The bicycle helps reduce our dependency on oil, it supports healthier lifestyles, and makes our cities more livable. And the bicycle, as World Bicycle Relief admirably states, “helps people prosper” by closing the distance to schools, jobs, and sources of water and food. Watch the video below. While we sometimes take for granted the bicycle as a democratic instrument of peace and empowerment, we also love that almost anyone can ride a bicycle – rich and poor, young and old, and yes, even Nobel Peace Prize winners. We rounded up a few examples below. 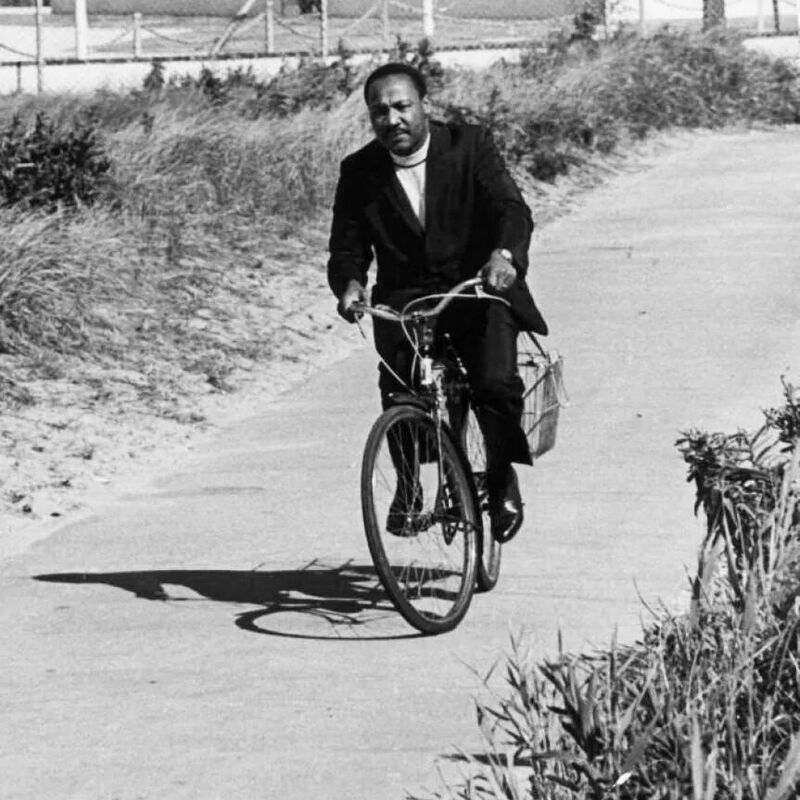 Martin Luther King Jr riding a bike. Desmond Tutu riding to fight TB. 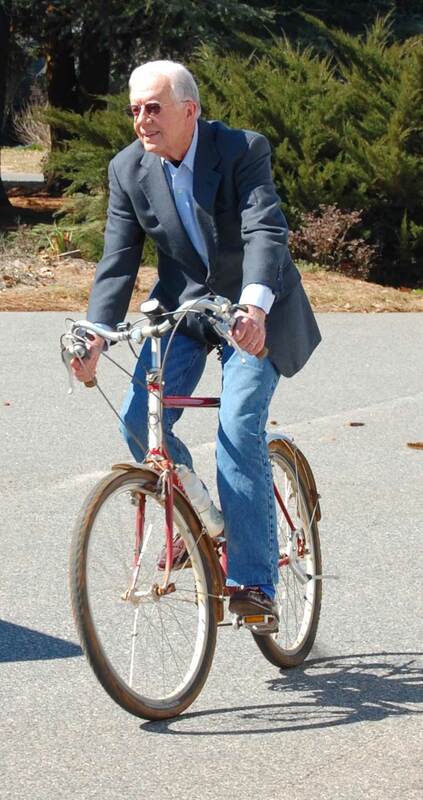 Jimmy Carter riding a bicycle. Barack Obama riding a bicycle. We asked a few of our favorite tastemakers, writers, and trendsetters who also happen to ride PUBLIC bikes to share their top bike apparel. Their responses range from vintage dresses to classy bike gloves and prove that you can really wear anything (even a wedding dress) while riding a bike! Elsie and Emma of A Beautiful Mess love to wear vintage or handmade dresses with tights or leggings when they ride their PUBLIC C7 bikes. They love this vintage inspired holiday-themed dress from Modcloth. Joanna of A Cup of Jo likes wearing any loose dress (She’s sporting one from Madewell in this shot) because it’s easy to hop on and off her PUBLIC C7 step through bike in a dress. She also favors high waisted jeans because “you don’t have to worry about your jeans riding down when you’re riding!” She thinks Madewell makes the best high waisted jeans. Jessica of Hapatime loves wearing Converse sneakers when she goes for a spin on her PUBLIC V7 and also recommends sweater dresses because they keep you warm and cool at the same time during the crisp Fall weather. Marcia of tablehoppper rides her PUBLIC mixte everywhere and finds that a pair of white leather Giro LX cycling gloves is the perfect accessory. These gloves have a classic look to them, with just enough modern performance features. We’re excited that our favorite restaurant columnist was recently selected the winner of Time Out New York’s Win the Ultimate New York Life competition. Prepare to read insightful, fun dispatches from NYC next year from Marcia! Though not recommended for daily riding, if you’re a bike lover who’s about to tie the knot you might consider getting a snap of you in your wedding gown while riding a bike. Risky, perhaps. But the result, beautiful. Emma of A Beautiful Mess proves it’s entirely possible with this gorgeous photo of her wearing her handmade wedding dress while riding her PUBLIC C7. It’s all about comfort and practicality for Weylie. When she’s riding her PUBLIC Bike she’s usually running errands or meeting up with friends, which is why causal outfits that suit the occasion are her go-to. Her go-to closed toe casual shoes are Nike. It’s a bike. It’s a disco ball. It’s…the Karaoke Rickshaw. For most of us, a bike is simply a way to get around. But with lots of creativity and ingenuity, bikes like the Karaoke Rickshaw can bring together a community of friends and strangers in public spaces over song, dance, and laughter. We first spotted the Karaoke Rickshaw on a lunch break outside our office in San Francisco. Even though it is San Francisco, a city full of characters and silly traditions, it’s not often you see a rolling, shiny karaoke disco ball-shaped vehicle. We’re drawn to the fact that the Karaoke Rickshaw brings smiles to faces and also brings something (singing) that’s largely done inside into the public realm. And that’s why the Karaokoe Rickshaw got our attention. It invites “play” in our public spaces – and helps people feel connected and, yes, a little happier. Watch the below video to see some of the fun. Our staff has spoken and out of all the awesome new bike-related products we added to our offering this year, these were their top bike-related gifts. Some you can stick into a stocking and some are meant to spoil, but all of them are road tested and PUBLIC staff-approved. View the complete Staff Picks Gift Guide on our website. PLEASE NOTE: Our Sacramento Holiday Pop-up at HOT ITALIAN is closed. A huge thanks to all who visited and stay tuned for more PUBLIC pop-up events in Sacramento. Till then, please visit us online or at our other retail stores. We’ve opened our new PUBLIC Pop-Up Showroom at HOT ITALIAN (1627 16th St) and we want to celebrate with you at our Grand Opening Party. It’s going to be a great event on Saturday, November 7 from 11:30am-3pm in support of the American River Parkway Foundation. Our regular showroom opening hours will be 11:30am-6pm every Saturday and Sunday through the holidays. During the day of our party, we’ll donate $50 for every PUBLIC Bike purchased and HOT ITALIAN will be donating 100% of the proceeds when you purchase their special meal deal — a BELLUCCI or PIRLO pizza with two Two Rivers Cider or Racer 5 IPA from Bear Republic — to the American Parkway Foundation, which does amazing environmental education and stewardship work to conserve the region’s greatest recreational civic amenity. Everyone attending our party will receive a raffle ticket to win prizes. Prizes include a PUBLIC Mini Kids Balance Bike, PUBLIC Works posters, other fun PUBLIC gear and accessories, and gift certificates to HOT ITALIAN. And if you donate $50 and up at our party to become a member of the American River Parkway Foundation, you’ll receive more raffle tickets to maximize your chances of winning our prizes. Looking forward to seeing you there and please share this event out with your friends. The more the merrier. Humans shouldn’t have all the fun when it comes to dressing up for Halloween. This season we asked local designer Joe Irwin to transform our PUBLIC Mini Balance Bikes into a herd (yup) of little seahorses. The result is currently hanging in the window of our PUBLIC Bikes San Francisco shop in Hayes Valley and couldn’t be any more playful and smile-inducing. Joe was game enough to draw up a how-to-guide that that you can use to fashion your own Seahorse PUBLIC Mini Balance Bike or use as a reference should you want to create an adult-sized version. And speaking of the adult-sized version, check it out on our Instagram here and Joe’s website here. And also check out these these other bicycle Halloween costume ideas. Download the complete DIY seahorse instructions along with the template here. Or check out the instructions for creating your own seahorse bike below. Trace all shapes from the Seahorse Template onto the Foamular Rigid Insulation Panels. Using a hotwire or blade, cutout all the foam pieces. Glue all tail rib pieces into place. Cut and form all metal pieces. Metal pieces include the rear hub tail end support, tail base frame connection, and head connection. Connect the rear hub tail end support by drilling a hole and gluing the bolt from the support into the tail. Glue the tail base frame connection to the tail with the screw pointing out (to connect to the frame). Connect the head connection to the head by carving out a slot and gluing the piece in, with the tabs exposed. Paint, glitter, and bedazzle all foam pieces. Insert and glue velcro straps into foam cutouts at the tail and the body. Glue the head velcro straps to the exposed metal tabs. Connect the tail by slipping the metal tail end support behind the rear hub bolts, connecting the base through the frame bolt hole. Tighten the nut and tighten the velcro strap around the seat post. Connect the body by tightening the velcro straps around the frame. Connect the head by slipping over the handle bar connection and tightening the velcro straps. Images from @meghantelpner on Instagram. Scrolling through our Instagram feed one day we were surprised to find a few photos with the most tasty shots of our limited edition PUBLIC C7 bike in yellow. Tasty because the color alone reminds one of bananas (the power fuel of PUBLIC employees), but also because the bike was paired with the most delicious and colorful assortment of food. We reached out to this foodie + bike lover and learned that she was Meghan Telpner, a Toronto-based author, speaker, nutritionist, and founder of the Academy of Culinary Nutrition. Turns out she got the yellow PUBLIC C7 bike from her local bike shop Cycle Couture and was using it for a photo shoot she was staging for her upcoming cookbook. We’re excited to announce that Telpner’s cookbook, The UnDiet Cookbook, launched just this week. Congrats, on your new cookbook Meghan! The photography is beautiful (not just because our bike is featured throughout 😉 and the recipes are plant-based and friendly to nearly every diet. It’s our pleasure to share a recipe from her cookbook that we think would make great fuel for before or after any bike ride. Enjoy! 1. Place all the ingredients in your blender. Blend until smooth. The famous Champs-Elysées boulevard in France has been nicknamed by the French la plus belle avenue du monde, “the world’s most beautiful avenue.” In homage to this tree-lined boulevard we created the PUBLIC D8i Champs-Elysées Edition “PUBLIC’s most beautiful bike” — an elegant ride for trips to neighborhood cafes, shops and along any boulevards in your hood. The PUBLIC D8i Champs-Elysées Special Edition bike harkens back to a classic bicycle that has been in the PUBLIC collection for a long time — a stunning 1950’s-era aluminum mixte bike, the French Mercier Meca Dural 3 Speed Randonneuse. We have written before about how this Mercier served as one of the major inspirations for the current PUBLIC mixte bikes. The Mercier’s unisex “mixte” frame, with its moderate sloping downtube built for both men and women riders, was revolutionary and its shiny aluminum tubing has a gleam that is reminisent of the PUBLIC D8i Champs-Elysées Edition. The PUBLIC D8i Champs-Elysees Edition is built off our premium 8-speed Alfine internal hub commuter PUBLIC D8i bike in gleaming chrome. We’ve upgraded the saddle with the inimitable, Brooks B17 leather saddle in Antique Brown that coordinates with our Antique Brown ring grips. To carry your necessities we’ve added the PUBLIC Porter Rack in Silver. And for safety and style, the handcrafted Spurcycle Raw Bike Bell is included. The PUBLIC D8i Champs-Elysees Edition is being offered at the Special Introductory Price of $1,099 $1,500. We decided to give our bikes some extra shine this Fall by introducing five luminous, limited edition colors. What sets these colors apart from our current assortment is a subtle glitter undertone that really shines in the light. We only produced a handful of these new limited edition color bikes in each size and hue, so if there’s one you like we recommend you act quickly because once they’re gone, they’re gone. These limited edition colors are only available online now for pre-orders.